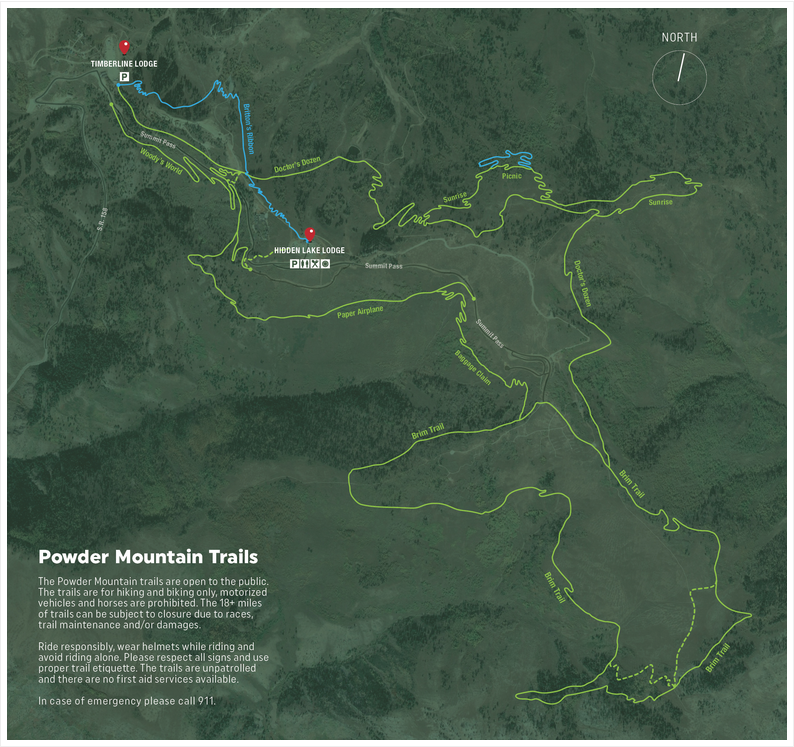 The 26+ miles of trails at Powder Mountain are free to the public. Hidden Lake Lodge offers mountain bike rentals, snacks, retail, refreshments and the best tacos in town. Turn right at the Summit Pass Road and follow the signs to Hidden Lake Lodge. Rental pricing begins at $39. Helmet rentals and retail is also available. Bike rentals are available by appointment. Hidden Lake Lodge will be closing for summer operations Sunday, September 23rd. Full Trail closures are possible during trail running and MTB events. Please check Powder Mountain social media and alerts on website for up to date info. The Powder Mountain trails are free to the public. The trails are for hiking and biking only, motorized vehicles and horses are prohibited. The 26+ miles of trails can be subject to closure due to races, trail maintenance and/or damages. Please respect all trail closures and warnings. Ride responsibly, wear helmets while riding and avoid riding alone. Please respect all signs and use proper trail etiquette. Please stay on marked and posted hiking and biking trails only. Off-trail travel is not permitted. The trails are unpatrolled and there are no first aid services available. In case of emergency please call 911. Explore more services around Powder Mountain Mountain Biking in our Trip Planning section.